This is a photo of a middle finger which shows the permanent blue ink vote mark. Usually it is the index finger which is marked thus but if two elections come close together then the middle finger is used. 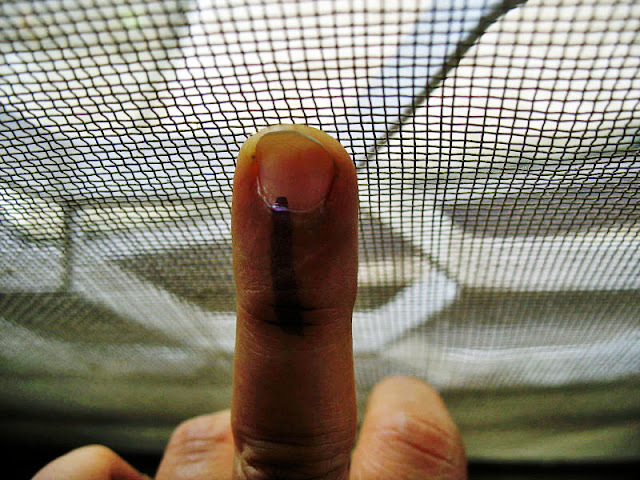 I liked this photograph because the netting symbolized prison and the finger pressed against it meant that the voter is a prisoner of sorts. He is forced to vote for a candidate whom he knows is useless and/or corrupt because there is none other. The other option is a no-vote.